« Gain Some Veggies and Protean–Not a Belly Roll–With Orgain! Treadmill Desks Are Becoming More Affordable and Accessible! For those that know me, I am a big fan of treadmill desks. 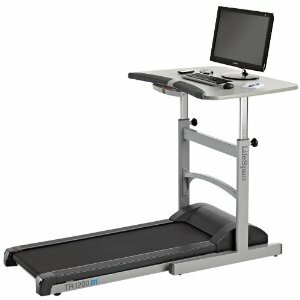 However, up until recently the main treadmill desk available was the Walkstation, for $4400-$4900, from Steelcase. And that may be too hefty of a price tag for small offices and the self-employed. Now more options are lower prices have become available! I am posting some of the best user reviews and options I found to date. The treadmill part comes totally preassembled, and you just have to unpack it and roll it into place. It seems to work just as you’d expect, and feels solid under my feet. It plugs into the desk with a really simple, only-one-possible-way to plug it together plug to connect it to the desk controls. The wires run almost entirely interior to the desk leg, an elegant solution. While in use, it’s very quiet. My biggest annoyance is that it doesn’t plug into your computer via a USB or something to track your long-term progress, and if you pull the dead-man stop it resets all your mileage / time, etc. Personally, I think 2.5 mph is great for just surfing the net. Two mph works for most typing. 1.5 mph is for drinking coffee and more serious typing, and about 1 mph for eating breakfast with a plate under it while surfing the web before the coffee kicks in. Shelley goes on to talk about the desk itself: The work surface allows me to comfortably stores my laptop, phone, folders, mouse and water bottle. The console was very smartly designed where it does not slide under the desk or sit on top of the desk like the others I looked at. One of my favorite parts is the built-in step counter…it is fun and VERY motivating to watch the steps add while you work or play. As mentioned earlier the treadmill is very quiet and have asked people while on speakerphone if they could hear the treadmill and they could not! The treadmill has 4 levelers to ensure that the desk is level and the desk is very solid and stable. I get no movement and vibration on the desk and assume that is because the treadmill and desk are not attached. WorknMan “worknman” brings up some issues about typing versus mousing on the Treadmill desk: From the very beginning, typing seemed very easy for me while walking on this thing. Unfortunately, mouse precision took a pretty serious hit. This probably won’t be a problem if you’re a typical office worker and/or spend most of your day typing. But if you do a lot of mousing (like me), this could be a problem. In my case, using the mouse while on the treadmill is getting easier over time as I get more used to it, plus it is forcing me to use shortcut keys more to save time, so I guess that can only be a good thing 🙂 When I first got the treadmill, I couldn’t go any faster than 0.5mph before I could no longer control the mouse. Now I’m up to 1.0, and I can go as fast as 1.5, depending on what I’m doing. To order yours for about $1300, click here. Another option is the TrekDesk Treadmill Desk by Trek, for about $480. However, Amazon reviewer say this desk is not adjustable, rattles and shakes and is of such poor quality it’s not worth it. Check out the desk and reviews here. 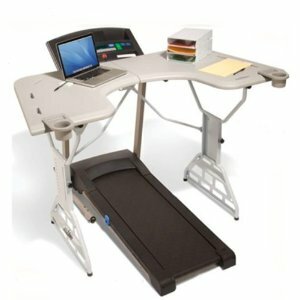 Another option is to simply add a treadmill, without handlebars to your existing desk set up. This may require you to add monitor risers to raise your monitor high enough to see it comfortable while standing. The TreadDesk is currently on back order, but at $840, this would be my first pick to retrofit an existing desk to a treadmill. The TreadDesk control panel sits on top of the desk and is attached to the Tread with a six-foot long wire. The control panel keeps track of distance, time, speed, calories burned and comes with an emergency shut off cord which should always be worn when using the TreadDesk. A rubber treadmill mat is also included with the purchase of each TreadDesk. If you want to read detailed user comments about the TreadDesk, click here. A cheaper option but far more labor intensive one is to build a treadmill desk yourself. Jay Buster, an options trader, created a blog called Treadmill Desk. (Today, while walking on his Treadmill Desk, Jay manages a private investment fund which is involved in option and structured product arbitrage.) He writes this post, The $39 Treadmill Desk, to tell you how to build your own treadmill desk for $39 (minus the cost of the treadmill, natch!). Treadmills are great for toning down body fats, i always use the treadmill and it is great for cardio too. Whether you like walking or running, treadmill is great for exercise.